The weather in the UK certainly challenges you in the wardrobe department. Yesterday I had organised a meet up with my two best friends in the afternoon for a late lunch following by drinks through to the evening. Now if I lived in sunnier climes that this transition from afternoon to evening would not have been a problem, but here is a different story. What do you wear when it's late April, the weather is veering between very cold and very slightly warm depending on the time of day and you want to wear something pretty, preferably without a coat? 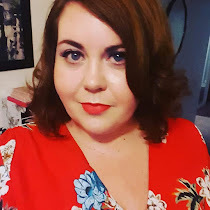 Well my answer yesterday was my new purchase of the absolutely gorgeous Enchanted Print Dress from +Simply Be with a long line teal cardigan, black leggings and my new black sandals, also from SimplyBe. Out of every outfit I have worn in my quest for brighter, more fashion forward clothing, this outfits brings all the pieces together for me and I love it. I feel confident and it makes me happy. What more can you ask for? What outfit puts an instant smile on your face? The German weather is also challenging. When will it just be warm???? Your dress is really cute, though. I love the print.